Senior Madison Ryan (10) moves the puck into the attacking zone. 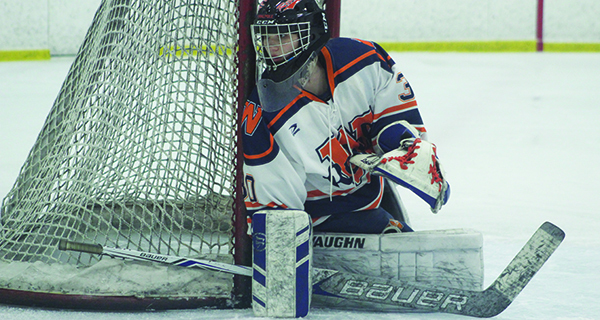 The two lead dogs in the Bay State Conference Herget Division squared off for the second and final time this season on Saturday afternoon as the Walpole Lady-Rebels (12-3-1, 7-3-1) hosted the Braintree Wamps (12-3-0, 8-0-0) at Rodman Arena. The Lady-Rebels, who entered the contest on a seven-game unbeaten streak dating back to January 9, when Walpole fell, 4-1, at Braintree, were out to avenge the previous defeat and hand the Wamps their first conference loss of the season. Senior goalie Kiera McInerney (pictured) hugs the post and keeps an eye on the play down in the corner. Unfortunately for Walpole, Braintree had no plans of handing over the reigns to the Herget Division. The Wamps outlasted the Lady-Rebs, 3-1, in a very physical affair to snap Walpole’s seven-game unbeaten streak. Following a scoreless first period that featured a big save by Braintree goalie Juliet Barney (20 saves) on a Kiley Hamilton breakaway bid, the Wamps drew first blood on the power play with 11:07 to play in the second. Walpole senior goalie Kiera McInerney padded away the original shot from the point by Mia Zaniboni, but freshman forward Maggie Burchill fired home the rebound to give Braintree the 1-0 lead. With 4:32 remaining in the period, sophomore forward Katie Meehan responded for Walpole with a wicked wrister from the slot up high to tie the game back up at one. Less than a minute later, however, Abbey Holland gave Braintree back the lead on a bit of a controversial shot up high on a two-on-one that beat McInerney and appeared to hit the crossbar, but was called a goal. The call gave the Wamps back the lead at 2-1 at the second intermission. 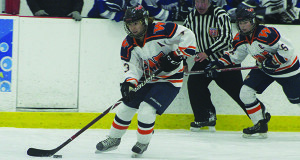 Senior captain Audra Tosone (3) carries the puck into the offensive zone on a two-on-one bid. The third period saw Walpole amp up its intensity on offense to try and tie the game at two, but Barney and the Braintree defensive corps played almost the perfect period by blocking shots and killing off a pair of Walpole power play bids. With 1:30 to play, Walpole yanked McInerney for the extra attacker in a last-ditch effort to knot the game at two. With just under a minute remaining, Ally Decoste fired home the game clinching empty-netter to give Braintree a 3-1 lead, and the Wamps emerged with the two-goal victory. The Lady-Rebs will look to get back on track against Milton on February 13.